In this recipe tried hands to make Garlic bread with some variation. 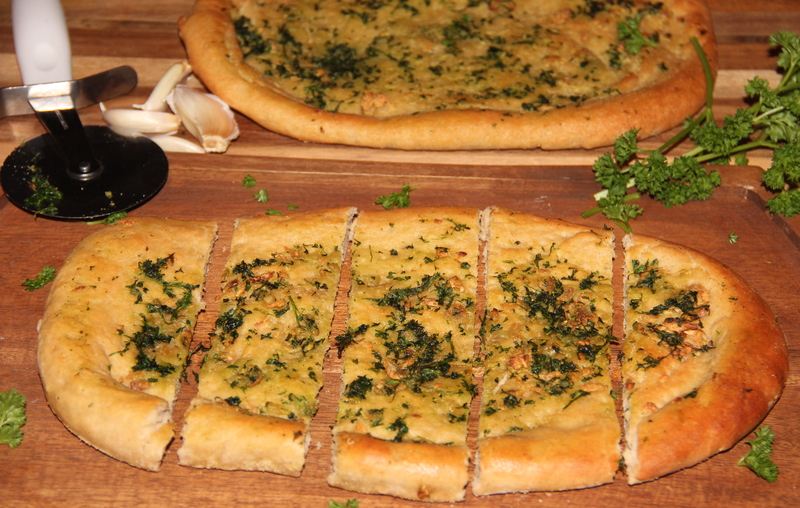 It is a flat bread with Parsley and Garlic spread. Dissolve yeast, honey in warm water and set aside for 5-10 minutes or until slightly frothy. Transfer the dough to the greased bowl and wrap with the plastic wrap and place in the warm place and allow to rise for about 1 ½-2 hours or until doubled in size. Place garlic, Parsley in a chopper and whizz until finely chopped. Pre-heat the oven at 220 deg C (Fan assited). Grease the baking tray/pizza tray and dust some flour/corn meal and keep aside. Take two rectangular baking sheet and grease some oil. Divide the pizza dough in half and roll out each into 2 rough rectangles (or lay out flatbread) on a baking prepared baking sheet. Allow to cool slightly and sprinkle some crushed black pepper and serve hot. Posted on March 5, 2015, in Appetizers, International, Main Course. Bookmark the permalink. 35 Comments. Auntjuju will be a pleasure to serve you flatbread with a fresh batch..
Yum! I’ve been a little skiddish around garlic since I accidentally ate a whole raw clove earlier this week, but I think it might be time to be friends with garlic again. Your flatbread looks great! OMG, I can almost smell this delight! 🙂 Yum! I love garlic bread–this sounds so good and I like that it is made with whole wheat flour!